It’s hard to believe that fall is just around the corner. But already I’ve noticed it’s getting dark earlier. I’ve seen Halloween candy and costumes lining the aisles at Target. The neighborhood Oktoberfest has already passed. Pumpkin Spice flavored everything is everywhere (when did this become such a big thing anyway??). And the most jarring thing of all — the temperatures are supposed to plummet into the 50’s overnight tonight! There are a lot of great things that come with fall’s arrival, though, such as cozy sweaters, the smell of wood smoke, and colorful leaves that crunch underfoot. There is also, of course, football. But before I delve into a slew of appetizers and dinners perfectly-suited for Sunday football gatherings, I wanted to share this healthy dinner recipe that’s both easy to make and delicious! 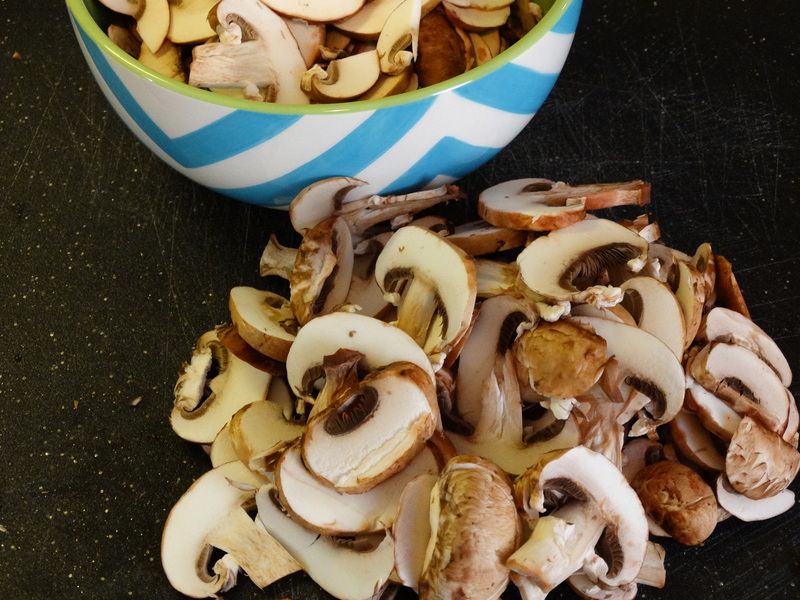 Begin by washing and slicing one pound of fresh cremini (also known as baby bella) mushrooms. Dice 1/2 cup onion and mince 3 garlic cloves. Heat a large skillet over medium-high heat and add 1-1/2 teaspoons olive oil. Remove 8 ounces hot turkey Italian sausages (I used two links) from its casing and add it to your pan. Sauté the sausage for 3 minutes or until no longer pink, using a spatula or wood spoon to crumble it as it cooks. When the sausage is cooked, remove it from the pan and set aside. Add 1 tablespoon olive oil to your pan, then add in 1/2 cup onion. Sauté for a few minutes, stirring occasionally. While your onions are cooking, bring 2-1/2 cups chicken broth and 1-1/2 cups water to a boil in a medium saucepan. Add 1 cup of polenta, stirring well to break up any clumps. Reduce heat to medium. Simmer for 20 minutes, stirring from time to time. 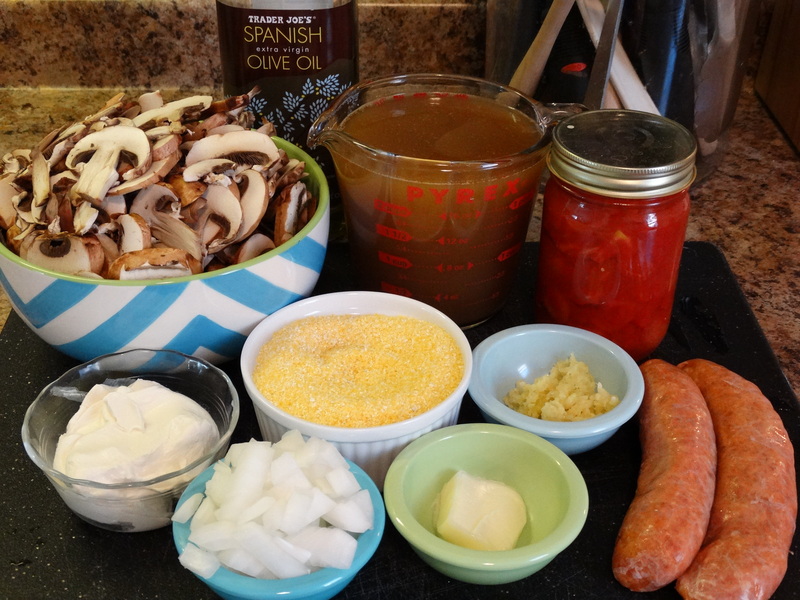 Once the onions are soft and translucent, add 1 pound of sliced cremini mushrooms. Sauté for about 5 minutes. Add 3 cloves of minced garlic and sauté for one minute. Stir in the sausage and one 14.5 ounce can of diced tomatoes. Bring it to a simmer, reduce the heat and continue to simmer gently for 15 minutes. 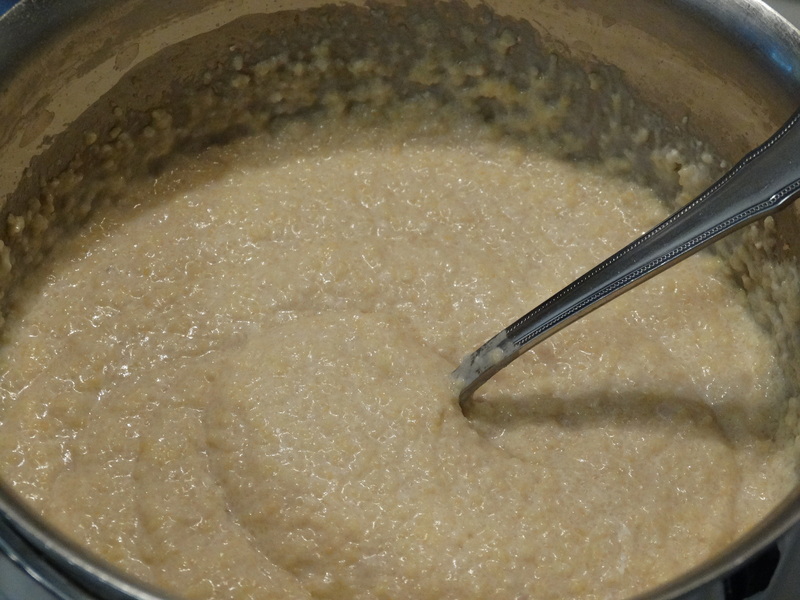 After 20 minutes, your polenta should be nice and thick. Stir in 4 ounces reduced-fat cream cheese and 1 tablespoon butter until blended evenly. Remove from heat. I think this creamy polenta tastes like mac and cheese – yum! Serve the mushroom and sausage ragù over the polenta. Don’t forget to add something green to your plate! Dinner is served — enjoy! 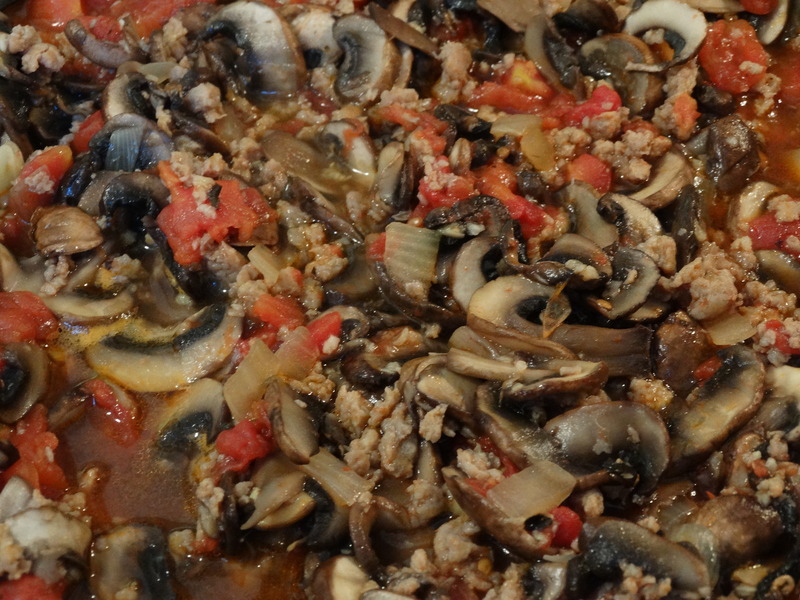 1) Wash and slice 1 pound cremini mushrooms. Dice 1/2 cup onion. Mince 3 garlic cloves. 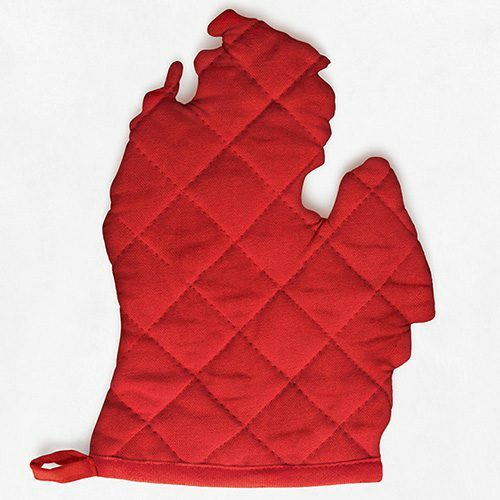 2) Heat a skillet over medium-high heat. Add 1-1/2 teaspoons olive oil and 8 ounces hot turkey Italian sausage, removed from its casing. Use a spatula or wood spoon to crumble it as it cooks. 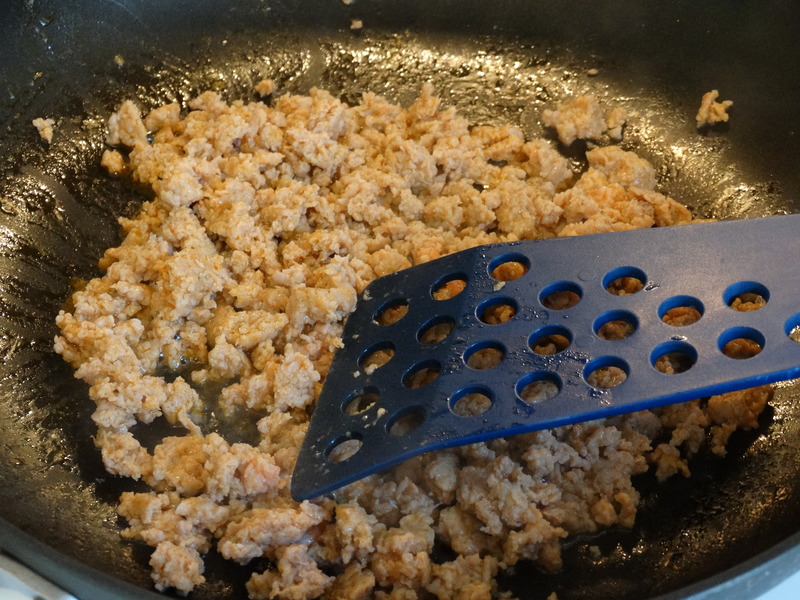 Remove the sausage from your pan when completely cooked and set it aside. 3) Add 1 tablespoon olive oil to your hot pan along with 1/2 cup diced onions. Sauté until soft and translucent, about 3 minutes. 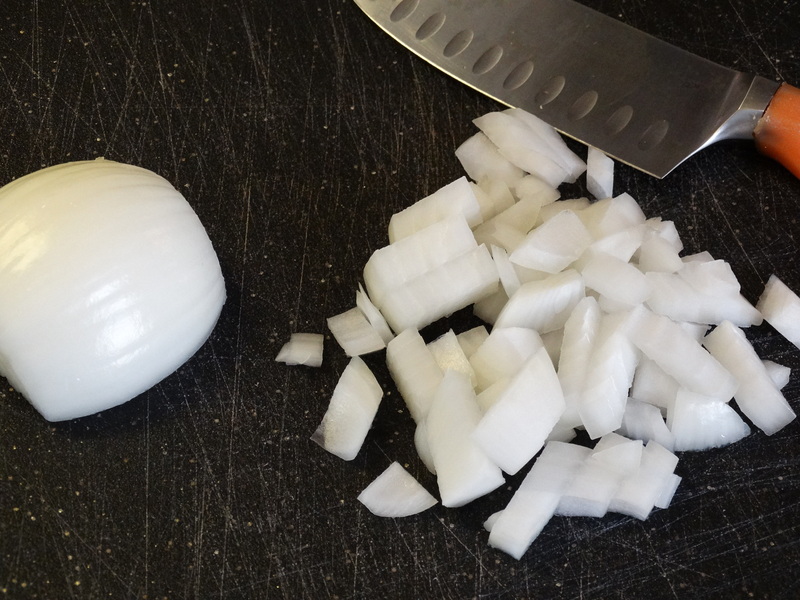 4) While your onions are sautéing, bring 2-1/2 cups reduced sodium chicken broth and 1-1/2 cups water to a boil. Add 1 cup uncooked polenta and stir to break up any clumps. Reduce heat to simmer for 20 minutes. 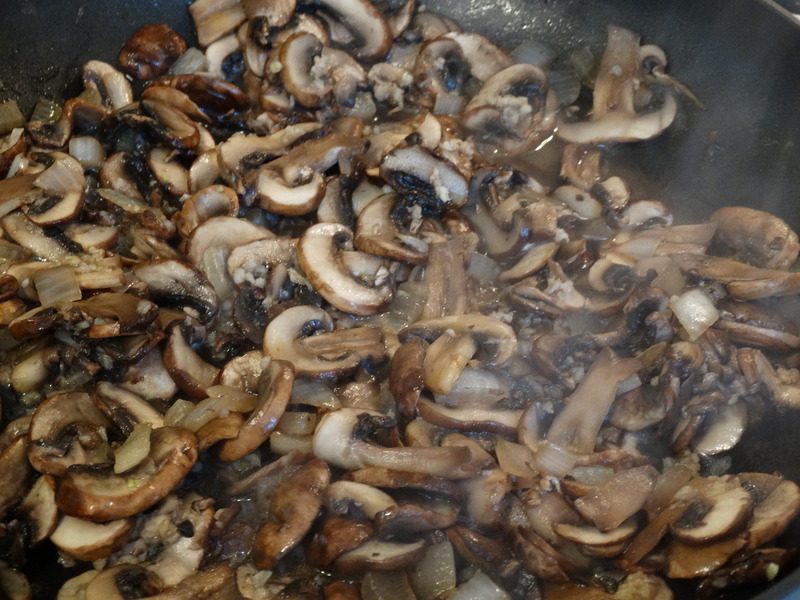 5) Add 1 pound sliced cremini mushrooms to your hot skillet and sauté for 5 minutes. Add 3 cloves minced garlic, cook for one minute. Stir in sausage and one 14.5 ounce can diced tomatoes. Bring to a simmer, reduce heat and continue to simmer gently for 15 minutes. 6) When your polenta is ready, stir in 4 ounces reduced-fat cream cheese and 1 tablespoon butter. 7) Spoon ragù over polenta. Enjoy!